Today the second grade campers answered this with a resounding, “Hoah!” They incorporated the orange sticks into their battalion routine as they prepared for the soon arrival of the Friday Night Show! If you haven’t already, be sure to invite some to the Friday Night Show! 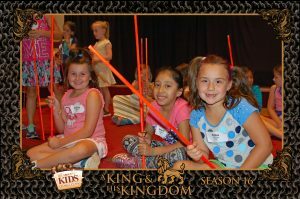 It will be a great celebration full of worship and praise as the campers share what they’ve learned about a King and His Kingdom!